Civilization runs on refined energy and refined materials. While refined energy needs no introduction these days, most people need reminding that there is no economy without steady supplies of the most basic refined material of all: aggregate. A new map from the state government's geologists is alerting us that California cities and regions must keep thinking locally to keep prospering. The big three commodities that define aggregate are sand, gravel and crushed stone. They are essential for modern roads, whether white concrete or black asphalt, and for the deep roadbeds beneath them. They underlie foundations of all kinds: railroads, pipelines, skyscrapers and apartment blocks, gas station tanks, stadiums. Every pothole filled requires aggregate from somewhere, usually fresh from a quarry. Recycling is important, but limited. You can't use any old sand and gravel. Some deposits have chemically active minerals like pyrite; others are too weak or full of dust. Every construction project specifies a tightly controlled grade of material, and concrete, the mixture of aggregate and portland cement holding it together, is the most demanding. Concrete is 80 percent aggregate. The numbers that follow refer to concrete-grade aggregate. These days, the state goes through more than 200 million tons of high-grade aggregate every year, the equivalent of more than 7 million trips by large diesel trucks. Take a minute and consider the wear and tear those 7 million truckloads put on the roads; beyond that, trucking aggregate produces a huge amount of carbon emissions. And it adds 15 cents per mile to the cost of every ton delivered, or $7.50 per ton for the typical 50-mile haul on straight roads with little traffic. The material itself costs around $10 per ton for mining, crushing and other processing. As California's population rises, local regions must plan to reduce their waste output, decrease their water usage, and manage many other aspects of environmentally sustainable practices. 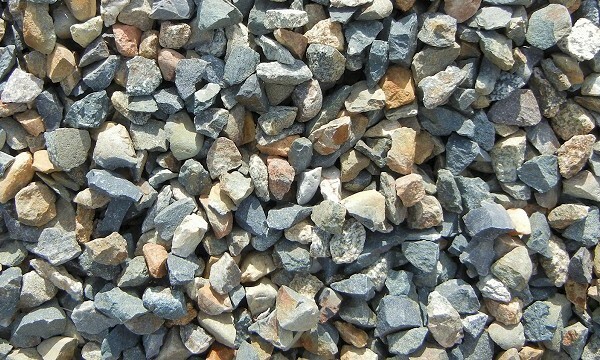 Aggregate, too, needs to remain sustainable. The transportation costs of aggregate mean that it must always have a local source. Whether that source is artisanal aggregate from a boutique rock quarry or a big pit of good cheap river graveleither is fineis up to your local and regional jurisdictions. And quarries aren't awful things; once played out they can be repurposed for all sorts of uses. Where does the new map fit in this picture? 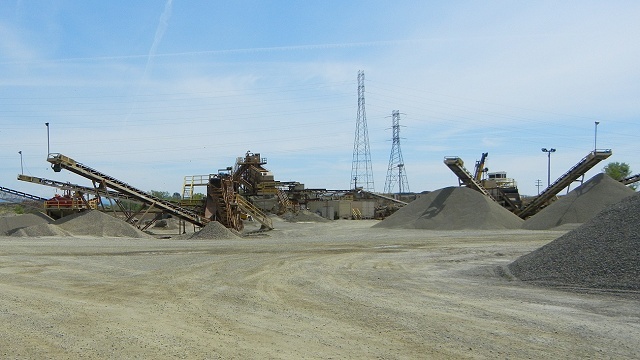 The California Geological Survey has been classifying the state's mineral lands, based strictly on geological data, since 1975, and it follows the aggregate industry closely. The CGS has found that population is the best gauge of demand for aggregate, so it's a straightforward if intricate exercise to work out which regions are doing fine and which need to issue more quarry permits to keep up. The CGS issued its first statewide map of aggregate supply and demand in 2002 and updated it in 2006 and 2012. The latest edition, Map Sheet 52, was released this spring and covers about 85 percent of the total market. 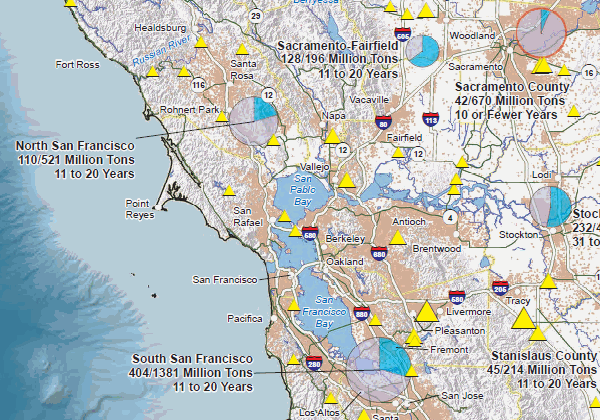 Today four "aggregate study areas" of California have aggregate reservesbodies of suitable material with companies permitted to produce themthat will last less than 10 years. They are important, fast-growing regions: San Diego, Sacramento, Fresno and the San Fernando Valley. Only a little behind, with 11- to 20-year reserves, are 13 other areas that encompass the Bay Area and most of the Los Angeles conurbation. Placer County and the Yuba CityMarysville area are set for life with enormous reserves, but as I mentioned, transport costs limit where they can be profitably marketed. It seems to me that nearby Sacramento is probably OK if a dedicated rail connection can be set up. As the distance of quarries from their markets continues to grow, the costs of aggregate will keep rising. Sooner or later those costs will hit limits that force hard choices. Surges in demand, such as those after a large earthquake or a Delta levee failure, could stress and fracture the system. It behooves our leaders, and citizens who care, to stay farsighted about this basic matter. Meanwhile the CGS is considering more sophisticated maps to help decision-makers. The aggregate industry is weighing in too; the website calcima.org sends mixed messages (imported Chinese cement is not related to the aggregate supply), but its links page is useful background.